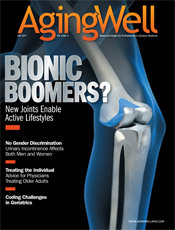 New devices, technologies, and rehabilitation strategies make joint replacement more appealing than ever to boomers who expect to maintain active lifestyles. It’s important to recognize the impact urinary incontinence has on patients’ quality of life and formulate a strategic management plan. Learn to penetrate the façade. Patients’ psychological issues and personal challenges can exacerbate physical ailments. Proper geriatric coding requires accurate documentation to ensure Medicare authorization and prompt reimbursement. This procedure can alter the function of the targeted brain structure, significantly improving the symptoms of Parkinson’s disease. Poor oral health can lead to tooth decay, tooth loss, and pain that can affect your patients’ wellness and quality of life. It’s critical to be aware of oral status as an indicator of overall health. Although they’re variable in capability and price, technological innovations can create a profound impact on patients’ quality of life. But patients’ abilities—and disabilities—determine the appropriate technologies. Systemic illness, decline in normal immune function, medication intolerance, and dry skin can all contribute to annoying itch. The challenge lies in establishing an accurate diagnosis. 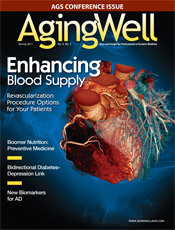 Physicians can choose from a number of promising revascularization procedures to enhance blood supply following a patient’s heart attack. Physicians should educate patients on nutrition issues, making them aware that judicious diet choices lead to better health and longer life. Research supports the link between diabetes and depression that requires screening and treatment to minimize the possibility of health complications. Review the array of products designed to help in the treatment and enhance the lifestyles of your patients. 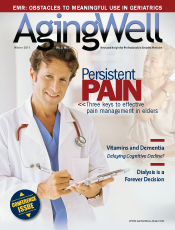 Physicians need to recognize and address the prevalence of chronic pain among older patients. Based on careful patient assessments, both pharmacological and nonpharmacological approaches are viable. Integrating alternative medicine with conventional therapies can be effective and beneficial to patients. But if your patients are using alternative medicine regimens, you need to know. Hefty costs and the absence of compelling incentives to invest in health information technology contribute to the sluggish adoption of meaningful use in geriatrics areas. Kidney disease patients must be armed with knowledge that enables them to select appropriate treatments, including dialysis. Physicians should initiate discussions soon after diagnosis to prevent the need for decisions under pressure in emergency situations. 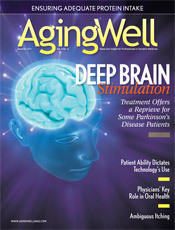 Vitamins and Dementia — Delaying Cognitive Decline?